If you want to know how good a restaurant is, just ask my Mom, the ultimate amateur restaurant critic. As one of the best home cooks around she definitely has high standards and expectations when she eats out and is never afraid to tell you her true opinions. From checking the silverware and glasses for spots, to expecting the meal to be served delicious, hot and beautifully presented, to relying on attentive servers who cater to her every need without spending a fortune, my mother will settle for nothing less than the best. 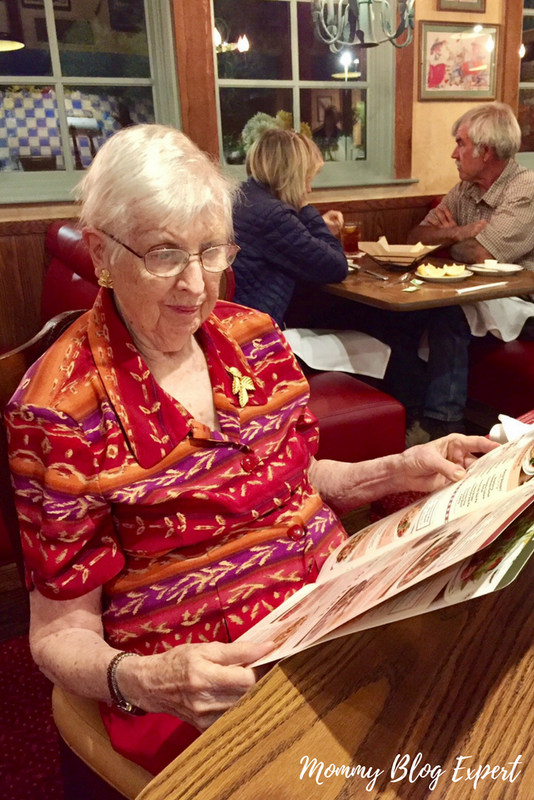 Want to know what my mom honestly thought of Mimi's Cafe, a family-friendly national restaurant chain with a French American vibe? Read on to meet my mother and for a candid recap of the dining experience for two we had at the Mimi's Cafe in Tucson, Arizona. Before we get into the food and service, here's a bit of background on this eatery. The charming restaurant decor at the location we visited, like all Mimi's Cafes across the U.S., takes its inspiration from the neighborhood bistro cafes commonly found in France with a decidedly American New Orleans twist. 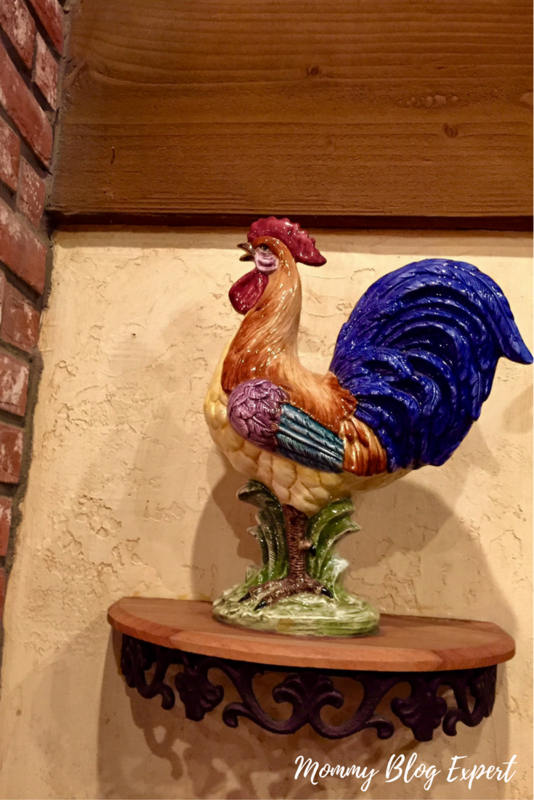 Look for it in the rafters, you'll always find the restaurant's rooster mascot at every location. Don't let that fool you, though, this is no cookie cutter restaurant chain. 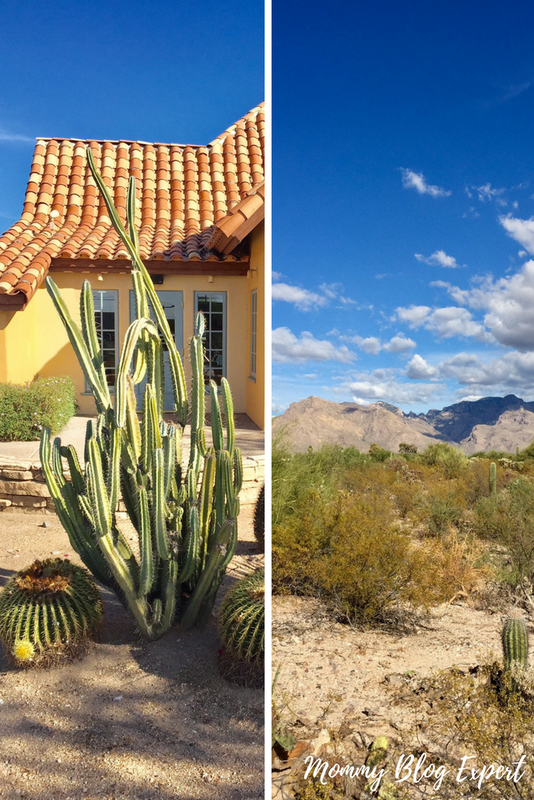 Not only is each Mimi restaurant's interior unique, as you can see from the beautiful desert and cactus exterior and views of the surrounding mountains at the Tucson locale, each cafe's overall design also embraces the best of its local surrounding community. 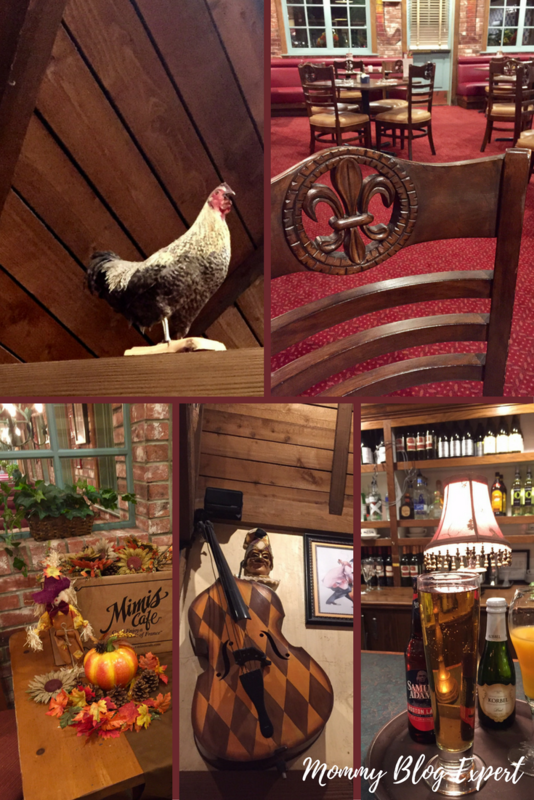 Our eating adventure to sample Mimi's special fall seasonal menu (still available for a limited time) as well as to try some of the newest dishes off the year-round menu, began as soon as we walked in. 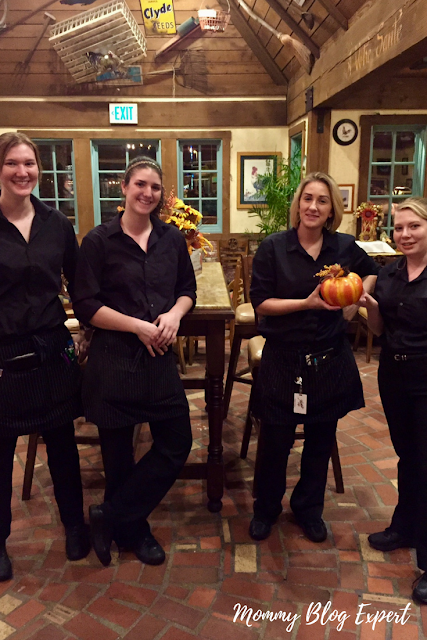 We were greeted warmly by the hostess, then promptly seated at a lovely table in the dining room. To start Mom ordered a glass of white zinfandel wine upon the recommendation of our server, Lisa. 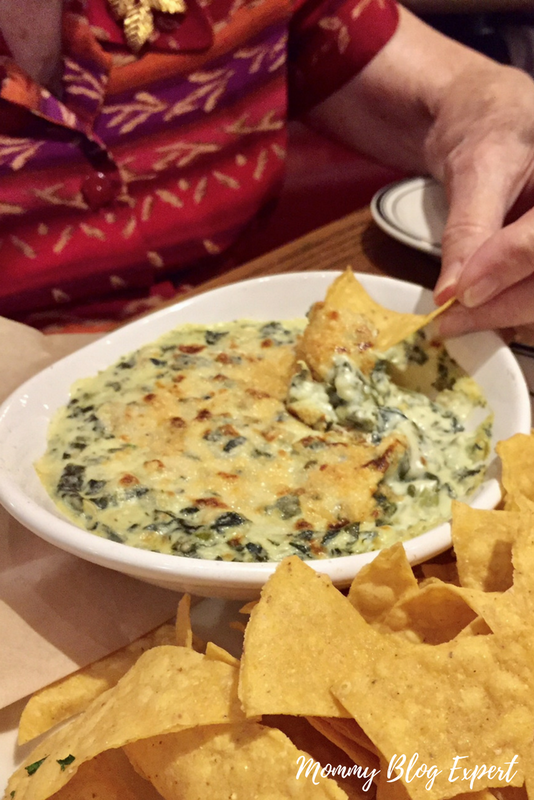 Then we enjoyed the delicious Warm Spinach Artichoke Dip with House-made Tortilla Chips (pictured above) as an appetizer. Mom was surprised the dip also had kale in it, a vegetable she doesn't normally care for, yet she thought it was still excellent and would definitely order this dish again. Next up was the note-worthy Mimi's bread basket, consisting of French baguettes and carrot raisin madeleines, served with a side of butter. 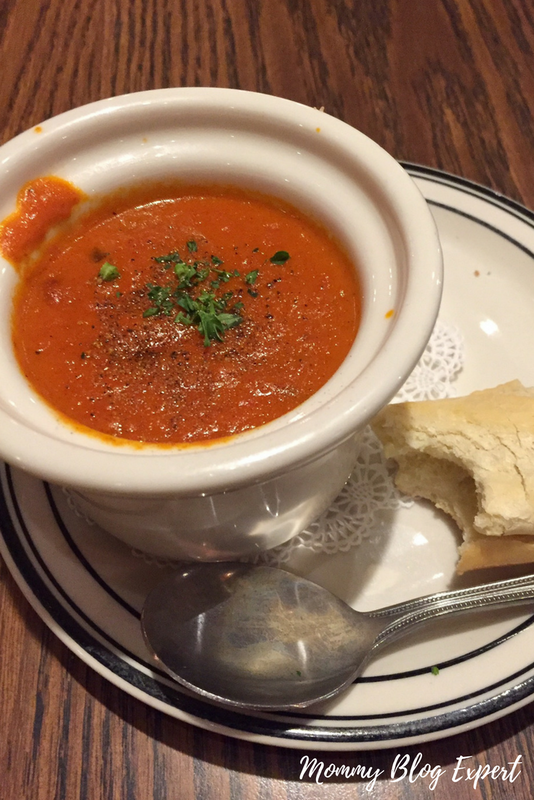 To go with those fresh baked savory and sweet breads, Mom tried a cup of the French Onion Soup and I had the vegan Tomato Basil Soup (pictured). Both soups were deliciously thick, homemade style made from scratch with fresh vegetables and served piping hot. For the main course, Mom loves seafood, so she enjoyed the Coastal Shrimp Pasta with linguine, roasted broccoli and grape tomatoes, garnished with a grilled lemon. Meanwhile, I savored every bite of the Hibachi Plate with Salmon you see pictured here, consisting of a huge plate of grilled fish set atop a bed of colorful, perfectly seasoned Asian stir fry vegetables and whole grain rice in a honey teriyaki glaze and sprinkled with black and white sesame seeds. To complete our wonderful meal, Mom ordered the Mimi's Petite Dessert Ensemble which included her choice of three desserts presented on a platter. The look of joy on her face when her treats arrived, tells you how big of a sweet tooth she has, for sure. 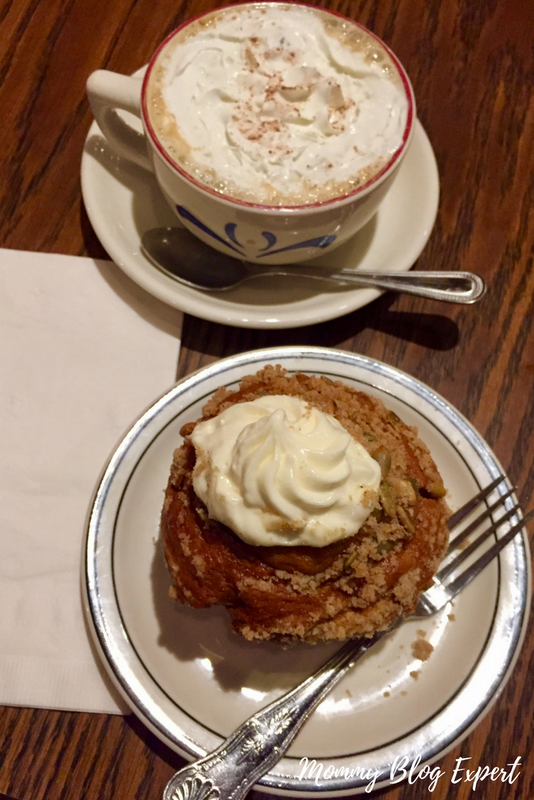 I'm partial to pumpkin, so for my own dessert I chose the Pumpkin Spice Muffin stuffed with cream cheese filling and a Pumpkin Spice Latte from the special limited time Fall Blackboard Features. Both were absolutely amazing and went well together. In fact, the muffin was so rich and moist, I saved the other half for breakfast the next morning. Mom commented on how generous all the servings were for every course in the meal and was thrilled with the big bag of nicely packaged leftovers she took home, as you can see from her smile. I love my mom and always enjoy visiting her, to laugh and talk about random things. Both of us agree our dinner at Mimi's Cafe was one of the nicest times we've had recently sharing a meal together. No doubt about it, this particular evening was made even more memorable and fun by all the delicious food, ambiance and good service we experienced. Dine in and spend some quality time with your kids and family to enjoy these and many of the other freshly-prepared items on the menu. 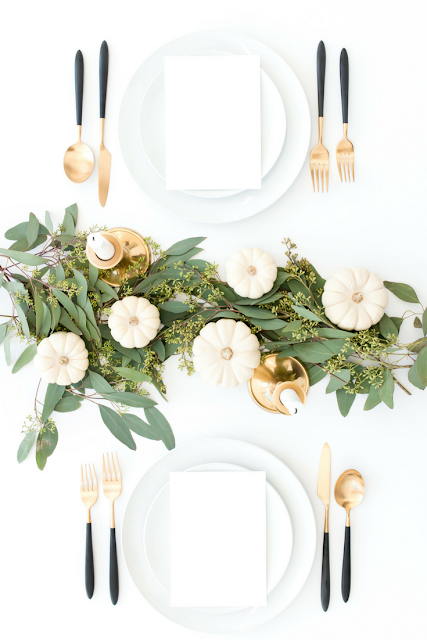 If you'd prefer to eat at home, check out the special seasonal Chef-Prepared Holiday Supper serving 8-10 people, including dessert for just $99.99 for the package. 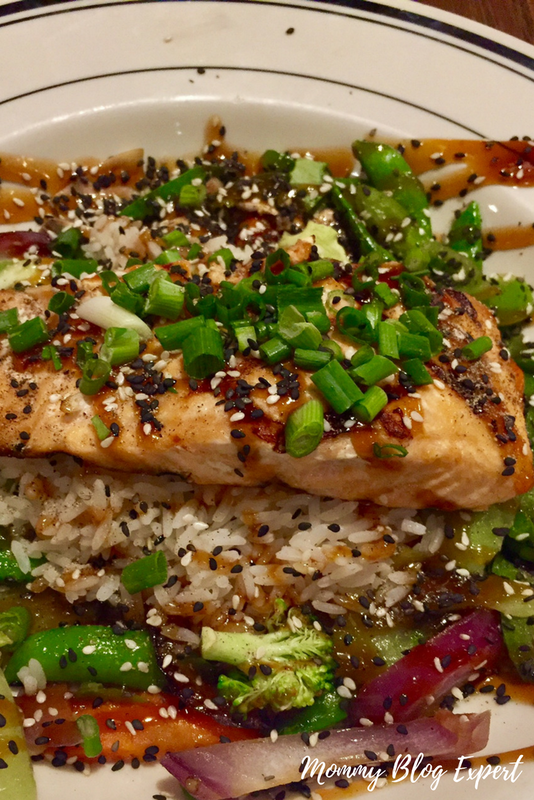 Mimi's Cafe offers breakfast, lunch and dinner. Find the location nearest you. 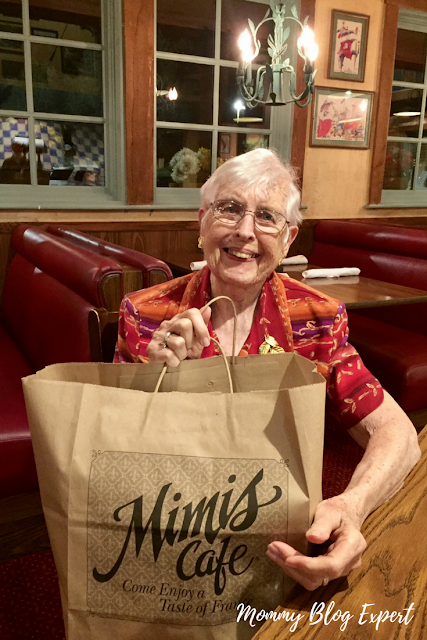 With a mom-approved restaurant like Mimi's Cafe, which is affordably priced, has good food and a wonderful atmosphere, why not consider bringing your own loved ones in to try out their menu soon? 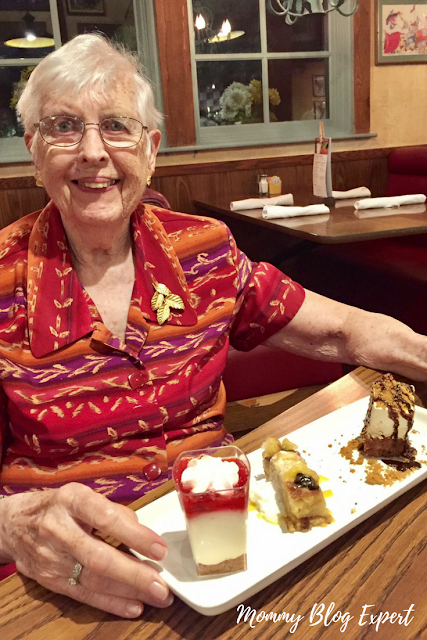 The featured Mimi's Cafe is located at Tucson Mall, 4420 Oracle Road, Tucson, AZ, phone 520-690-9544. Founded in 1978 by Arthur Simms, who was stationed in France during World War II, Mimi's Cafe is a neighborhood cafe offering French Inspired American comfort food. With 97 U.S. locations in 18 states throughout the U.S., the menu continues to evolve with new and seasonal dishes reflecting the culinary traditions of fresh ingredients, bistro classics and American comfort food. To learn more visit the official site as well as follow the brand on Twitter, Facebook and Instagram. 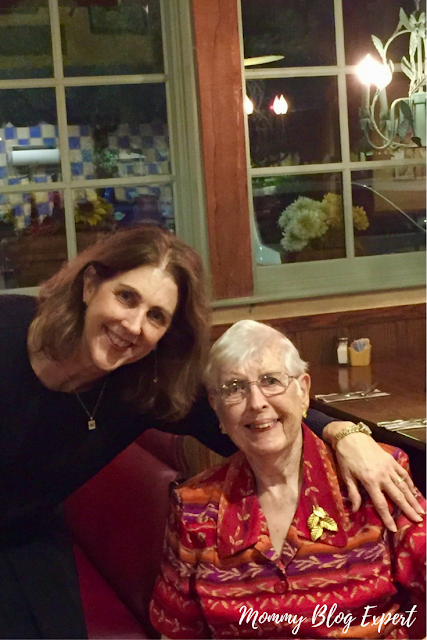 FTC Disclosure: My mom and I were hosted by Mimi's Cafe for this review and received additional compensation. However, opinions here are my own. See complete FTC Disclosure information that appears at the bottom of MommyBlogExpert's main page and at the bottom of every individual post on this blog, including this one.